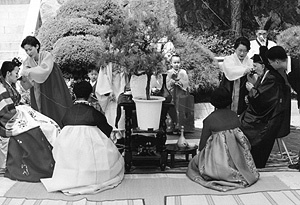 The bride and groom wear the traditional Hanbok. 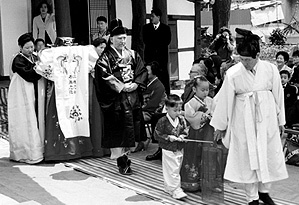 She follows the groom, and hides her face - symbolic of shyness and the first time to meet, face-to-face. The children (the bride's niece and second cousin) lead the way - symbolic of purity and innocence. 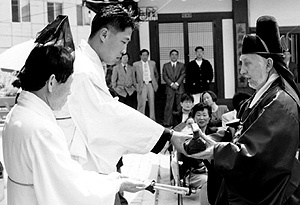 The groom offers the ‘wild goose’ to the bride’s family - symbolic of one mate for life as in the case of this water fowl in real life. 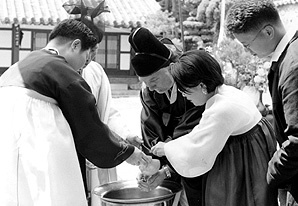 The groom washes his hands - symbolic of cleansing of the spirit. 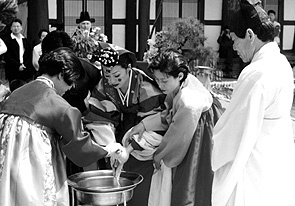 The bride washes her hands - symbolic of cleansing of the spirit. The bride and groom drink together - symbolic of same mind and body. 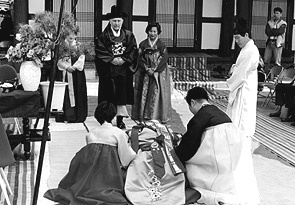 The bride bows to the groom - symbolic of acceptance.